In a medium nonstick pot, combine cornstarch with 1/4 cup cold water, and stir to dissolve. Add cherries, sugar, and cinnamon, and stir well. Set heat to medium. Stirring frequently, cook until thick and gooey, 12 - 14 minutes. Roll out dough into a large rectangle of even thickness. Cut sheet lengthwise into two even pieces. Cut each piece widthwise into thirds, leaving you with six rectangular pieces of dough. Arrange dough pieces with the shorter sides on the right and left. Evenly distribute cherry mixture among the centers. One piece of dough at a time, fold and stretch the lower left corner to meet the upper right corner. Press edges firmly to enclose the cherry mixture. With a fork, press edges to crimp and seal. Carefully transfer to the baking sheet. Bake until dough is golden brown, about 12 minutes. Enjoy! HG Alternative: If you can't find the Recipe Creations dough, go for Pillsbury Reduced Fat Crescent roll dough. (The products are nearly identical.) Then just pinch/seal up the perforations for a seamless sheet. HG Tip! If you've got the time, allow cherry mixture to completely cool. This will make the assembly process easier. If you're using the Reduced Fat Crescent roll dough, definitely let the mixture completely cool. Like most humans, we LOVE a good dessert. 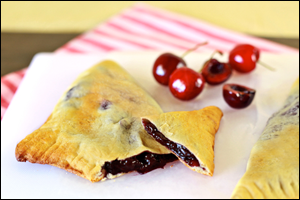 And buttery dough stuffed with gooey cherries is just the sort of thing we crave. But we're also highly aware of the calorie count and fat content of desserts like these. What's a Hungry Girl to do? Just NOT eat the delicious things? Um, no. We rounded up some smart shortcut ingredients -- frozen pitted cherries and premade dough -- and got to work. Our goal? 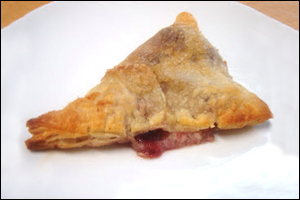 To perfect a recipe for decadent cherry turnovers with FAR fewer calories and fat grams than traditional versions. The glorious result is what you see to the left. Get ready to astound your friends with your baker-ific ways... or just impress yourself, and save the leftovers for later. Dessert is served! Now would be a very good time to share a cherry recipe. And all you have to do is click "Send to a Friend"! Today, August 6th, is National Root Beer Float Day. Top off your favorite diet root beer (we like the ones by A&W and Blue Sky) with a scoop of light vanilla ice cream... OR get sneaky and use frozen Cool Whip Free instead!